When you think of world-changing devices, you usually don’t think of the washing machine. However, making laundry manageable changed not only how we dress but how much time people spent getting their clothes clean. So complaining about how laborious our laundry is today would make someone from the 1800s laugh. Still, we all hate the laundry and [Andrew Dupont], in particular, hates having to check on the machine to see if it is done. So he made Laundry Spy. How do you sense when the machine — either a washer or a dryer — is done? [Andrew] thought about sensing current but didn’t want to mess with house current. His machines don’t have LED indicators, so using a light sensor wasn’t going to work either. However, an accelerometer can detect vibrations in the machine and most washers and dryers vibrate plenty while they are running. The four-part build log shows how he took an ESP8266 and made it sense when the washer and dryer were done so it could text his cell phone. He’d already done a similar project with an Adafruit HUZZAH. But he wanted to build in some new ideas and currently likes working with NodeMCU. While he was at it he upgraded the motion sensor to an LIS3DH which was cheaper than the original sensor. You might wonder why he didn’t just have the ESP8266 talk directly to Pushover. That is possible, of course, but in part 2, [Andrew] enumerates some good reasons for his design. He wants to decouple components in the system for easier future upgrades. And MQTT is simple to publish on the sensor side of things compared to API calls which are handled by the Raspberry Pi for now. Laundry monitoring isn’t a unique idea and everyone has a slightly different take on it, even some Hackaday authors. If phone notification is too subtle for you, you can always go bigger. Here’s a slightly different way to check on the status of your laundry. Instead of checking if the machine is vibrating, or listening for sound, or pulling everything apart and hacking an ESP8266 into it, check the power that the machine is drawing. This is what [Scrand] did in his IoT dryer build. 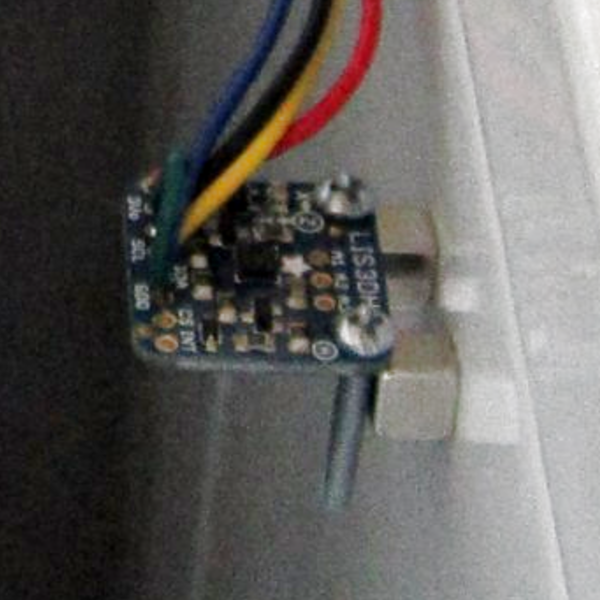 The secret behind the hack is the Sonoff POW, a small device that sits in between the wall and the dryer. It has a relay in it that controls it, but, importantly for this hack, it’s able to measure the power consumption used by what’s plugged into it. By installing the ESPurna firmware on it, he can now use all the power of the firmware to control and monitor what’s connected to the POW. He wrote a PowerShell script to monitor the http server now running on the POW checking on how much power is being drawn by the dryer. When that power drops, the laundry is done, and in the case of [Scrand], a text is sent saying so. When you’re sitting on the couch relaxing, why get up every five minutes to check your laundry when you can have it text you when you know it’s done? Then you can decide whether to get up and deal with it or just leave it until later. The whole reason ESPurna exists to begin with is to check on the status of the laundry. Or, you can go a bit overboard with this laundry room monitor. As with many tasks, robots may soon be ironing our clothes for us before we leave for work. Built by a team from the University Carlos III de Madrid’s robotics lab in Getafe, Spain, TEO is a highly articulated robot, that can climb stairs, open doors, and has recently added ironing to its skill set. Data from a depth-sensing camera in TEO’s head is combed over by an algorithm, breaking it down into thousands of points — 0 being smooth and 1 a defined line in the clothing. Comparing those point values to those of its neighbours allows TEO to identify wrinkles without any preexisting notion of what a freshly-pressed garment looks like. If like us you live in mortal fear of someone breaking into your house when you’re on vacation and starting a dryer fire while doing laundry, this full-featured IoT laundry room monitor is for you. And there’s a school bus. But don’t ask about the school bus. In what [seasider1960] describes as “a classic case of scope creep,” there’s very little about laundry room goings on that escapes the notice of this nicely executed project. It started as a water sensor to prevent a repeat of a leak that resulted in some downstairs damage. But once you get going, why not go too far? [seasider1960] added current sensing to know when the washer and dryer are operating, as well as to tote up power usage. A temperature sensor watches the dryer vent and warns against the potential for the aforementioned tragedy by sounding an obnoxious local alarm — that’s where the school bus comes in. The whole system is also linked into Blynk for IoT monitoring, with an equally obnoxious alarm you can hear in the video below. Oh, and there are buttons for testing each alarm and for making an Internet note to reorder laundry supplies. We’ve seen a spate of laundry monitoring projects lately, all of which have their relative merits. But you’ve got to like the fit and finish of [seasider1960]’s build. The stainless face plate and in-wall mount makes for a sleek, professional appearance which is fitting with the scope-creepy nature of the build. [domiflichi] is human and fallible. So he can’t be blamed for occasionally forgetting the laundry in one of the machines and coming back to a less than stellar result. However, while fallible, he is not powerless. What if his washer/dryer could email or text him about his laundry? It seemed simple enough. Add a vibration sensor to the side of the machine along with some brains. When the load is done it will bother him until he comes down to push the button or There Will Come Soft Rains. He started off with an Arduino-and-ESP8226 combination and piezo sensors. The piezos had lots of shortcomings, so he switched to accelerometers and things worked much better. We really like the way he mounts them to the side of the washer dryer using the PCB’s mounting screws as angle brackets. The case is a standard project box with some snazzy orange acrylic on the front. It took some fiddling, but these days [domiflichi]’s clothes are fresher, his cats fed, and his appliances more aware. Video of it in operation after the break.